The SSC Silent Speed Controllers have been specifically developed to overcome the problem of electronic hum which can be generated when using electronic controllers to control the speed of single-phase motors. They provide two speeds, full and between approximately 50-70% of full speed through capacitor switching which is a noiseless form of speed control. These controllers have been designed for use with single-phase Minitube, Minivent, Ringplate and Vogue Series axial fans and Gamma Series Roof Units. The controller is dedicated to the fan selected and cannot be changed with another. They are only suitable for controlling one fan at a time. 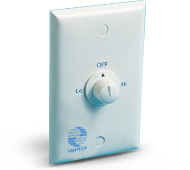 All units are recess mounted, have an enclosure rating of IP20 and come complete with a 70W × 114H switch plate, plaster board clip & capacitor. A recess depth of 55mm is required for mounting.